Fruition Sciences has partnered in the US with Vivelys and ETS Laboratories to provide an original sugar loading analysis based on Dyostem® readings. Dyostem® is a tool revealing berry sugar accumulation profile. It is manufactured by Vivelys and is available for purchase in the US. Dyostem® is also available through ETS laboratories as a service. Whether you own a Dyostem® device or use ETS labs. services, Fruition Sciences is helping you make practical use of your data to improve the monitoring of berry ripening. If you only work with ETS lab and want to use Dyostem®, ETS lab will provide you with the “berry weight” as an additional information to your usual fruit sampling. Further results, analysis, and mapping (listed below) will require being a Fruition analytics and a Vivelys customer. As you can see in Figure 1, after bringing 200 berries sample to ETS labs, you have access to your lab result report including berry weight, berry volume, quantity of sugar per berry, Brix, TA, pH, etc. All your fruit data is incorporated automatically into your Fruition analytics dashboards after each sampling. Figure 2 shows the display of Dyostem® results as it appears in your Fruition analytics dashboard. 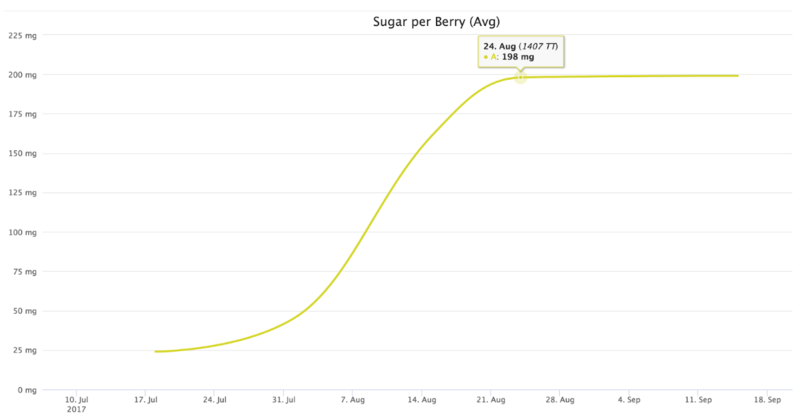 By tracking the time profile of sugar loading, you know precisely the stage of ripening the berry is at. This information, in turn, is used to support harvesting decisions. It can also be used to refine the timing of polyphenols analysis (here) prior to harvest based on the known relationships between pulp and skin composition during fruit ripening. You can go deeper into the analysis by working with Vivelys and Fruition Sciences. The goal of the partnership is to connect vineyard data compiled in Fruition analytics with sugar loading dynamics, volume loss, aromatic profile and sugar balance. 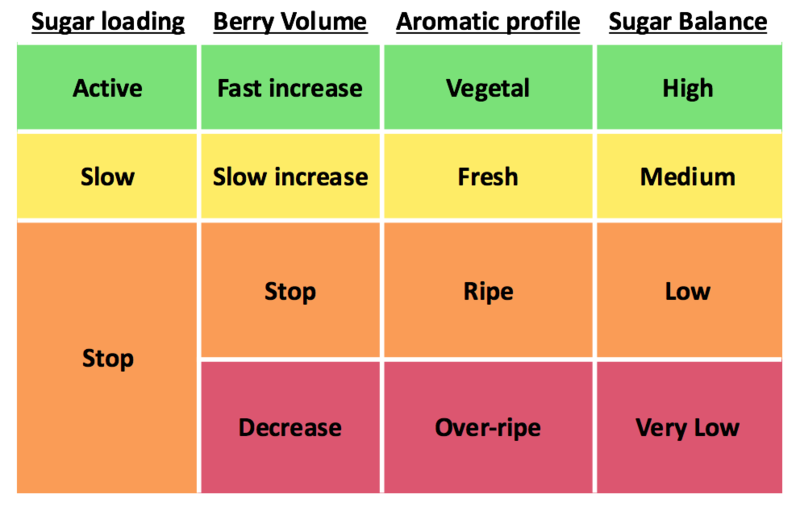 During the ripening period, customer assistance is provided by Fruition Sciences and Vivelys to visualize and interpret your fruit sampling results and support your picking decision with more data (Figure 3). Thanks to our partnership with Vivelys. Fruition analytics generates 4 maps following each sampling date. 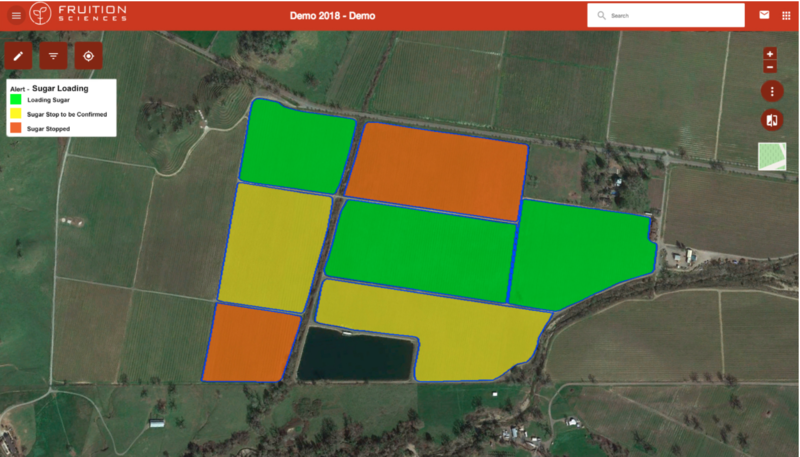 Ripening maps is a new feature in the industry. It shows how ripening profiles evolve with time across your different blocks. Depending on the time course of ripening, your blocks appear in different colors (as described in Table 1). You can compare current and historical trends and visualize in the blink of an eye slow ripening versus fast ripening blocks. If you wish to learn more about how to use Dyostem® in conjunction with Fruition analytics, to benefit vineyard and harvest management, have a look at the following article. ← How Dyostem® tracks sugar loading?